Located in the heart of Montreal, La Maison du Maroc is on of the first of several Moroccan culturalcenters planed for countries worldwide. 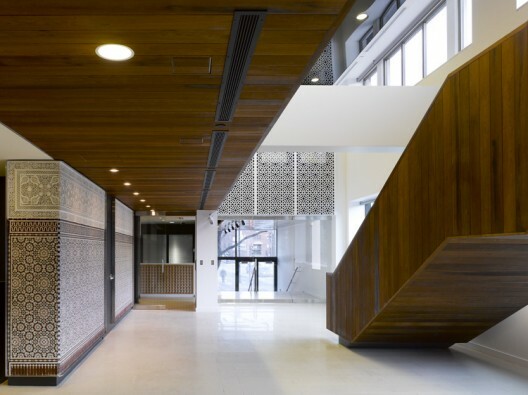 The intention of the center is tostrengthen cultural ties within the Moroccan community abroad.The architectural aspect of the project consists ofthe extensive renovation of a four storey, 1960's structure on the edge of thehistoric Vieux Port of Montréal. 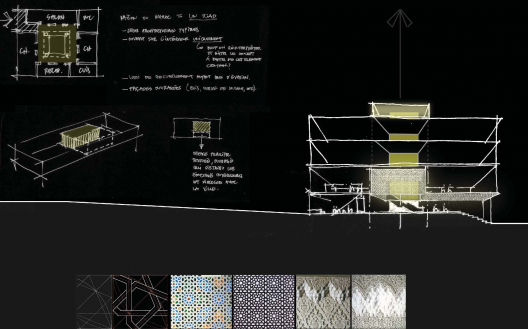 Carefully contemplated modifications were made to the envelope allowing additional natural light toenter, while reinforcing the presence of the building on the dominant cornersite. 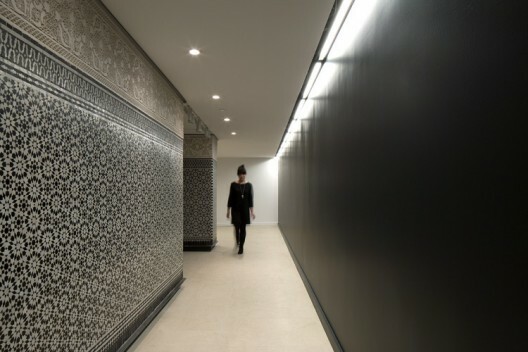 However, the majority of the intervention was focused inward, dramatically transforming the building's typical office floor plates into afunctional and dramatic space. The conceptual approach of the project references the traditional Moroccan riad house where the livingspaces are located around a central garden. It is this central open space that defines the heart of the complex, rather than the functions that surround it. In the case of La Maison du Maroc,a central double height void was cut out of the existing building mass to forma grand hall around which the cultural program was distributed. 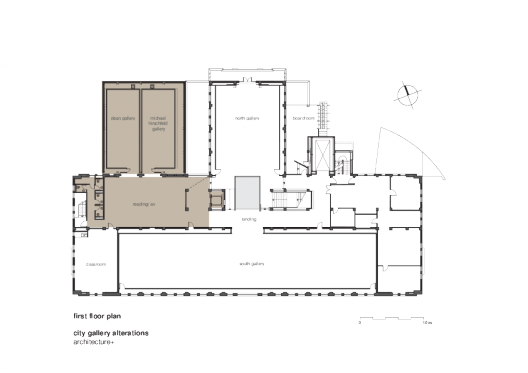 Multipurpose rooms, an exhibition spaces and classrooms serve to facilitate the objective ofcultural exchange. With the 12 000 volume library, exhibition hall, andlanguage school, the idea of cultural exchange is further reinforced. The newlyestablished heart serves both informal and formal gatherings large and small. The projects dominant internal feature, a substantialwood clad stair reorganizes the circulation of the building, and visually linksthe first and second floors as the public spaces unfold in richly textured finishes. The carefully selected finishes reflect the aesthetictraditions of Morocco, while reflecting the evolution ofmodernist Moroccan cultural heritage. 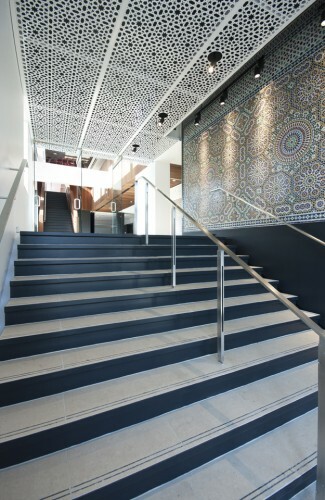 Importedmosaic tiles installed by visiting Moroccan artisans line the main circulationspaces and the walls that surround the central hall. 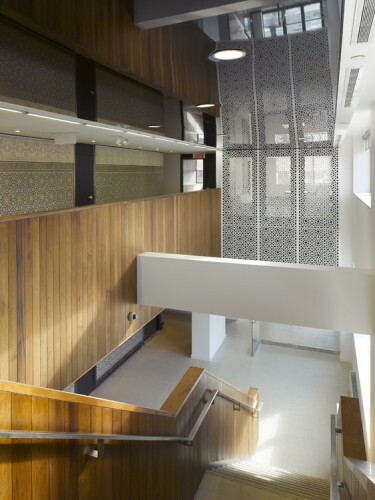 The two storey,laser cut metal screens, filter the newly augmented natural light and animateshadows across the grand hall marking the passage of time throughout theday. The grand opening in Montréal was well received by thelocal Moroccan community, Canadian dignitaries and visiting Moroccan Royalty.